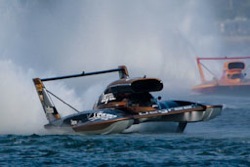 Jeffrey Dahl’s gallery of the 2011 Grand Prix West Series at San Diego Bayfair on Mission Bay. Jeffrey Dahl’s gallery of the 2011 Air National Guard Championship at San Diego Bayfair on Mission Bay. Jeffrey Dahl’s gallery of the 2011 Vintage Unlimiteds at Seafair on Lake Washington. Jeffrey Dahl’s gallery of the 2011 Albert Lee Cup on Lake Washington. Jeffrey Dahl’s gallery of the 2010 Albert Lee Cup on Lake Washington. 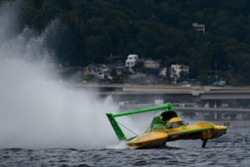 Lisa Courneya’s images of the Albert Lee Cup at Seafair in Seattle, WA. Chris Denslow’s images from Sunday’s action at the H1 Unlimited Indiana Governor’s Cup in Madison. IN. Chris Denslow’s images from Saturday’s action at the H1 Unlimited Indiana Governor’s Cup in Madison. IN. Chris Denslow’s images from Friday’s action at the H1 Unlimited Indiana Governor’s Cup in Madison. IN. Chris Denslow’s images from the second round of Spring Training in preparation for the 2010 H1 Unlimited season. Chris Denslow’s images from the opening round of Spring Training in preparation for the 2010 H1 Unlimited season. 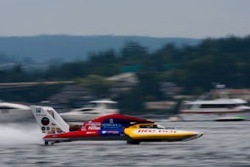 J. Michael Kelly in the U-7 Graham Trucking won his first hydroplane final in grand fashion, passing an ailing U-16 Ellstrom Elam Plus in the final lap to win the inaugural Oryx Cup UIM World Championship. Steve David in the U-1 Oh Boy! Oberto finished second giving him enough points to lay claim to both the team and driver H1 Unlimited National High Points Championship and retain the coveted U-1 designation for the 2010 season. Villwock in the U-16 had engine difficulty after a bumpy ride through the west turn on the second lap and the usually strong charging orange and blue hull started to compression stall and yellow flame came through the tailpipe. He managed to hold off Kelly until the final lap. 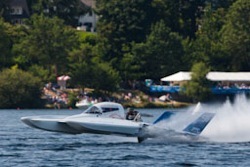 The final heat was rerun after Jeff Bernard in the U-5 Formulaboats.com flipped during in its initial running. Bernard was talking with the media and the crowd in Doha and appears to be fine. Dan Foard was part of the crew from Tampa Digital that provided the EXCELLENT live video streaming from the ABRA/H1 Unlimited final race in Doha, Qatar. Dan spent seven days in Qatar and ran the hand-held cameras during interviews and fixed cameras during qualifications and racing. Click the image at left to watch the unbelieveable final heat and check out Tampa Digital’s website for videos from rest of the weekend, including Jeff Bernard’s flip in the first running of the final heat and Steve David’s amazing blowover in Heat 4A. Duff Daily walked away unharmed from an amazing crash during the 2009 Rocky Stone Memorial Kilo Competition in Lincoln City, OR. View the entire gallery here. Jeffrey Dahl’s gallery of the October APBA Region 10 race held at Lake Sammamish in Issaquah, WA.